In the “Wikipedia” about this artist collected little bits of information. In principle, it is completely unknown to us. And first of all, precisely because he left the USSR and remained to live in the West. He worked a lot, he has a lot of canvases, which are now at Russian auctions “Sotheby’s” are valued in decent money. 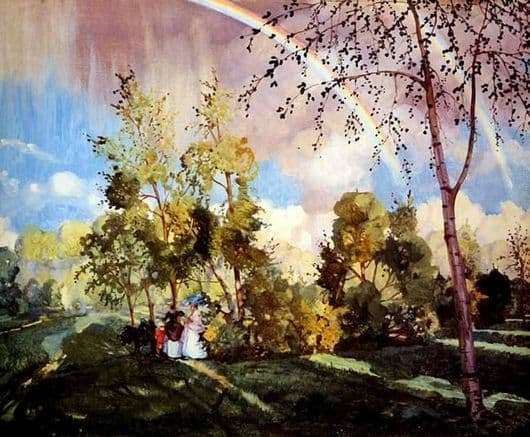 But at the same time, he exhibited many times in the Tretyakov Gallery, but this was before the revolution. And in pre-revolutionary Russia, he was very popular. Before us are two canvases on what seems to be the same theme – “Landscape with a Rainbow”. But there is something the same in them. The top canvas was created in 1915 and therefore it blows from it some kind of romanticism, some even mercantile spirit of village life. One can see a park with flowering beds and “walls” of climbing plants. And in the clearing freely cows roam. The rainy weather is their only joy, for the sweltering summer sometimes exhausts not only people, but also cattle. And in the arch hid the girl. But the thunderstorm had already passed, and the sun came out from behind the clouds, and therefore a rainbow formed on a dark background. On the second canvas, which was written in 1919, almost all the same. The same thunderstorm, but no animals. But now there are already two women with a child, who hid from the blind summer rain under the crown of trees. Changed colors. 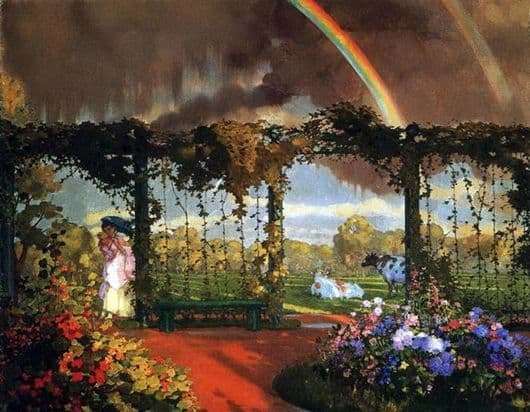 The first canvas was a bit gloomy, despite the colorful decoration of the flower bed; the second is bright and radiant. The landscape has changed – it has become more free, many trees. There was a place for both birch and shrubs. And the rainbow here is not against the background of dark clouds, but against the background of well-lit clouds. By the way, the drawing style has also changed a little. On the first canvas, everything was drawn in more detail, but in the second – somehow more boldly and without dwelling on the details.